See the Pricing page for questions about pricing and paying your bill at the Student Health and Wellness Center. As an extension of our customer service, the Student Health and Wellness Center (SHWC) clinic files medical insurance claims for the University endorsed student insurance policy underwritten by United Healthcare Student Resources, effective 8/14/2018-8/13/2019. See University Endorsed Student Health Insurance below for more details about this policy. At this time, the SHWC clinic does not file insurance claims for any other commercial carriers or policies. If you do not have the University endorsed student insurance policy, you may ask for an itemized receipt at check-out to file for reimbursement with your insurance company based on your current policy. If you have any questions about insurance, please contact the Billing and Insurance Department at (940) 369-8543. Information regarding the University endorsed student insurance policy for the 2018-2019 academic year, underwritten by United Healthcare Student Resources, may be obtained at the Student Health and Wellness Center or online at https://unt.myahpcare.com/. This plan becomes effective 08/14/18 and will run through 8/13/19. We have put together a brief summary of the policy benefits and costs to help with comparing your options. 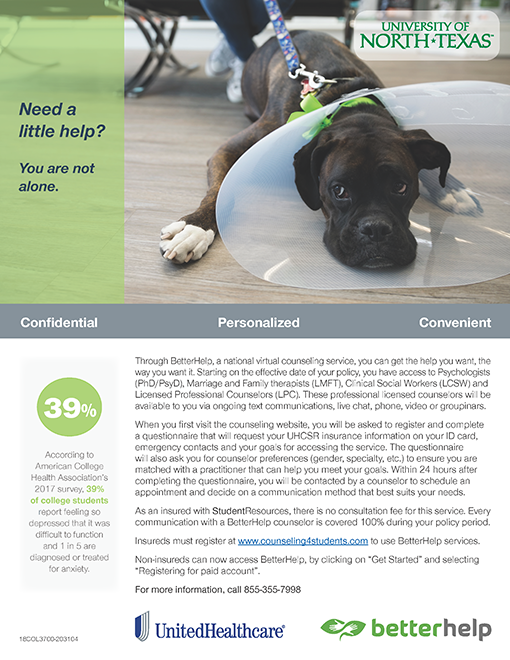 Students enrolled in the University endorsed student insurance policy are also covered for virtual counseling services through BetterHelp and telehealth doctor appointments through HealthiestYou. International students may go to the International Student Insurance page for more information on the insurance requirements for international students and the process to waive out of the University endorsed student health insurance plan. You can enroll for student insurance at https://unt.myahpcare.com/. 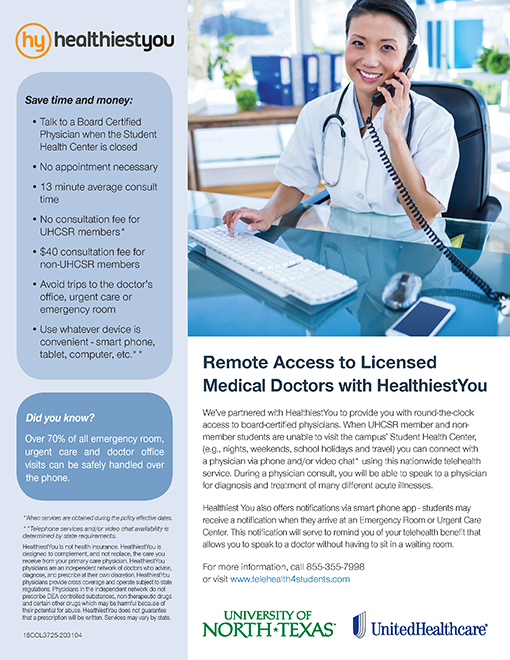 If you have any questions about enrollment, please call Academic Health Plans at 855-897-2984. Click here for a guide explaining your health insurance options under the Affordable Care Act.